When it comes to tiny smart speakers for your home, two products come to mind: the Amazon Echo Dot and Google Mini. The one that’s better for your situation depends a lot on the other devices in your home. Here’s a look at how both speakers stack up and why one is the best choice for most people. 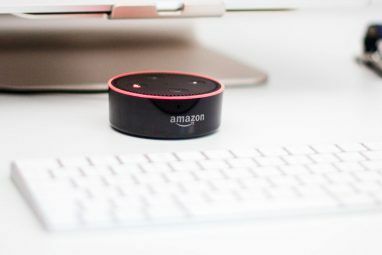 Back in September 2018, Amazon introduced the third-generation Echo Dot. An incremental update over the previous version, the 2018 Echo Dot is noted for having a cloth cover like the current Echo and Echo Plus. Inside, there’s also upgraded speaker drivers that offer better and louder sound. The speaker located inside measures 1.6 inches versus 1.1 inches for the previous generation. The overall device measures 3.9 x 3.9 x 1.7 inches and weighs just 10.6 ounces. Available in Charcoal, Heather Gray, and Sandstone, the 2018 Echo Dot also offers a new microphone arrangement which promises better performance. However, there’s only a four-microphone array in this year’s model versus the seven-microphone array on the older model. Beyond this, the Echo Dot still includes a 3.5mm port to connect an external speaker; you can also connect wirelessly through Bluetooth. Out of the box, the Echo Dot isn’t wireless. 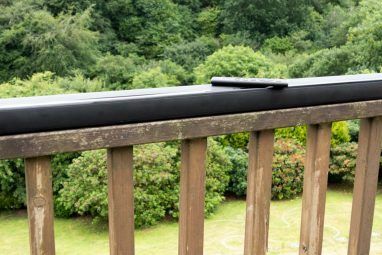 However, there are battery cases available that can turn it into a wireless speaker with ease. The Amazon Echo Dot, like all Echo speakers, offers Amazon’s voice assistant, Alexa. The first such digital assistant on the market, Alexa remains the No.1 voice assistant, although its market share has been dropping as smart devices have gained in popularity. A November 2018 survey shows that Alexa is installed on around 63 percent of smart speakers compared to Google Assistant’s 17 percent. Alexa’s larger install base allows Amazon to stay ahead of competitors when it comes to smart home integration. Through so-called Amazon Alexa Skills 18 Awesome New Amazon Alexa Skills You Need to Try 18 Awesome New Amazon Alexa Skills You Need to Try The Amazon Echo's list of skills is growing all the time. Let's take a look at the most useful and silliest skills from the past few months. Read More , you can use the Amazon Echo Dot to control your smart home products such as lights, heating systems, and door locks. These skills can also help you order a pizza, brush up on your trivia knowledge, and much more. To date, Alexa has 50,000 skills and counting. With Alexa, the Amazon Echo Dot is the gateway to the hottest music services on the planet. This list includes Amazon Music, Spotify Premium, Pandora, and iHeartRadio. Beginning in December 2018, Alexa also supports Apple Music. Priced at around $50, the Echo Dot remains the least expensive Amazon Echo products on the market. The low price often drops further before holidays such as Christmas and Father’s Day. These savings usually range from between $10 to $20 and Amazon usually extends these discounts to its retail partners including Best Buy and Target. Introduced in October 2017, the Google Home Mini measures 3.86 x 1.65 inches (weighing 6.10 oz.) and like the third-generation Echo Dot, is wrapped in fabric. Available color options include Chalk, Charcoal, Coral, and Aqua. The Google Home Mini even tinier than Amazon’s product and serves as a member of the growing Google Home lineup 5 Essential Tips to Secure Your Google Home Device 5 Essential Tips to Secure Your Google Home Device Using a Google Home smart voice assistant, but concerned about Google's record on privacy? Secure your data with these five steps. Read More of smart speakers that also includes the Google Home Max and 2018 Google Home Hub. 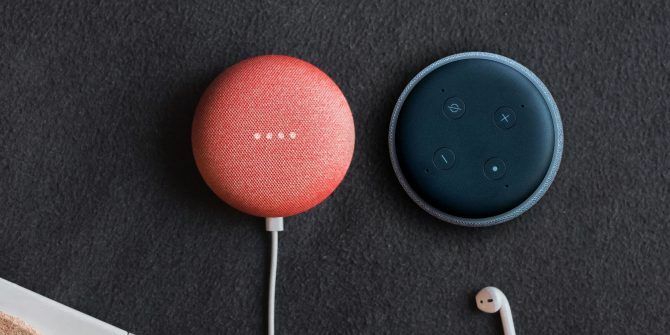 The Google Home Mini lags behind the Amazon Echo Dot when it comes to microphones (it only has two), although it does include a 1.57-inch driver. The Google device also lacks a 3.5mm audio port but does offer integrated Chromecast and Chromecast Audio streaming. Google Home products with Google Assistant arrived on the market much later than those with Amazon Alexa. As such, Google Home Mini doesn’t offer nearly as many skills. However, these skills are growing in number each month Google Assistant Learns New Conversational Skills Google Assistant Learns New Conversational Skills Google is pushing hard to make Assistant the one AI to rule them all. And at Google I/O 2018, the company has announced a number of new features coming to Google Assistant. Read More . To date, Google Home products support various music services including Deezer, Pandora, iHeartRadio, TuneIn, Spotify Premium, and its own products, Google Play Music and YouTube Music. In a similar price range as Amazon’s product (around $50), the Google Home Mini is often on sale, especially around the holidays. When comparing these speakers, it’s important to look beyond color choices and price since they’re nearly identical on both of these points. Digging deeper, the key differences become more evident. As you can see above, the 2018 Amazon Echo Dot bests the 2017 Google Home Mini in terms of hardware specs. It’s the one with more microphones, a slightly bigger speaker driver, and support for 3.5mm audio output. The winner here is clear: Amazon Echo Dot. These are tiny speakers and as such and I’m not sure design is all that important. Still, it’s clear Amazon wanted to copy the look of the Google Home Mini somewhat when it added fabric to this year’s Amazon Echo Dot. Design copycats don’t win, so on this point, the edge goes to the Google Home Mini. Amazon continues to lead Google regarding smart home compatibility. Despite this, it’s important to note that both platforms now support most of the mainstream smart home product lines. Winner: Amazon Echo Dot leads—for now. Short of only using Google Play and YouTube exclusively, the Amazon Echo Dot bests the Google Home Mini here. 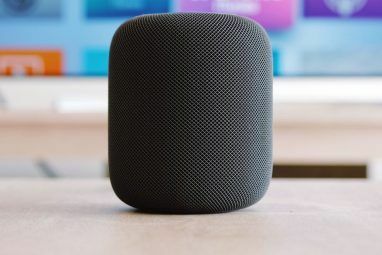 The new integration with Apple Music could make Alexa-based speakers even more appealing to the masses. Honestly, I think they draw on this point. Most of the interaction with these speakers is through voice and in 2018 both Amazon Alexa and Google Assistant perform well. It comes down to your personal search preference. Echo Dot vs. Google Home Mini: Which to Buy? As things stand, most people should select the Amazon Echo Dot over the Google Home Mini. For one, Amazon’s product is newer. For another, Alexa is still better than Google Assistant on the most critical points. Despite this, the overall smart home market is changing rapidly. As such, the possible arrival of a second-generation Google Home Mini in 2019 could quickly twist the dynamics 180 degrees. Again, however, at least for now, the Echo Dot is the one to buy. Buy one and set it up today How to Set Up and Use Your Amazon Echo Dot How to Set Up and Use Your Amazon Echo Dot Just got an Echo Dot and need help setting it up? We'll show you how to set up your Dot and explain everything you need to use it, plus troubleshoot common problems. Read More ! Explore more about: Amazon Echo Dot, Google Home Mini, Smart Speaker. Obviously written by an iThing user.